When responding to a HSC Visual Arts Unseen Images question there are three key factors to consider, both in regards to what you write and how you write it! Luckily, this applies to both short and extended responses, making the formula even easier to follow. Throughout this article we’ll be working through an example together using the painting ‘The Kiss’ by Gustav Klimt. When analysing any artwork your mind should go straight to the four “frames” of art; structural, subjective, cultural and postmodern. By looking at the artwork through these ‘frames’ you can form ideas about it and the artist, which you can then discuss in your response. · How has the artwork been made? · What techniques have been used? · What materials have been used? · What is the composition like? · What is the mood of the work? · How is the mood created? · What do you think the artist felt? · What does the audience feel? · When and where was the work made? · How has this influenced it? · Who was the artist? · How did their context influence the work? · Does the work appropriate another artist? · Does it appropriate another artwork? · Why does it appropriate them/it? · How has it changed the original meaning? These are going to be you key points or ideas for your responses, so think of them as you headings or themes for your paragraphs. If it’s a short answer question, you’ll probably only need 1-2 of these, or very short points on 3! Structural: Painted with oil paint and gold leaf on a 1.8m x 1.8m canvas in 1907-1908. The composition is balanced, focused entirely on the two figures in the central vertical third of the painting. Subjective: The work is warm and gentle, the yellow and gold tones create a sense of peace and joy while the figures’ posture and posing gives an impression of affection and love. Cultural: Klimt was an Austrian painter and created this work a few years before the First World War. The painting likely reflected this peacetime softness. Postmodern: The painting hasn’t appropriated any other artists but has since been appropriated many times. The conceptual framework looks a bit closer at the context of the work – where and when it was made, who made it, etc. Obviously you won’t know that much for an unseen image, but usually you’ll be told the year a work was made and by what artist. With this info, plus the image itself, you can usually take a guess as to where it might have been made and in what context! Think of this as your backup information – it’s great for fleshing you your paragraphs and adding detail or evidence to your ideas about the frames. Because the image is an unseen one you usually can’t get too deep into the contextual framework, but if you happen to know a little more about the artist then feel free to get detailed! Audience: The audience was Europe of the early 1900s when the painting was first made, and they received the work well, many praising it and someone quickly buying it. To modern audiences the work is an icon regarded as Klimt’s most popular painting. Artist: The painting is typical of Klimt’s Symbolist work and is one of the many works that make up his ‘gold period’. It’s thought that he painted it as a response to peoples’ negative reactions to some of his earlier, more provocative pieces – he aimed to soothe people with this affectionate work. World: By itself the painting doesn’t say too much about the world but it does reflect several art movements of the time; Viennese Art Noveau, Symbolist paintings and Klimt’s own ‘gold period’ that he would come to be known for. Borrowed from English essay writing teachings, S.T.E.E.L is an acronym used to easily recall how to structure body paragraphs for essays in a clear and concise way. However, it can also be used to format short and long responses for unseen images in art! Introduce the topic of the paragraph; this may mean naming the artwork, artist, year it was made and the materials used. It’s also important to mention what you’ll be saying about the artwork in the paragraph, such as if you’re looking at the cultural significance of the work, or its postmodern meaning. This is where to talk about the method or materials used in the artwork! Mention things like use of colour, line, what types of paints or materials are used, etc. This is a good place to talk about different principles and elements of design! Talk about how the artwork has specifically used the techniques mentioned above. Example: “Artwork X shows a clever use of colour as the image is dominated by a blue and orange colour palette, which are complimentary colours.” In this case use of colour is the technique and blue/orange complimentary colour palette is the specific example. What impact has the technique/example had on the work or the audience? How do you think the artist wants people to react? 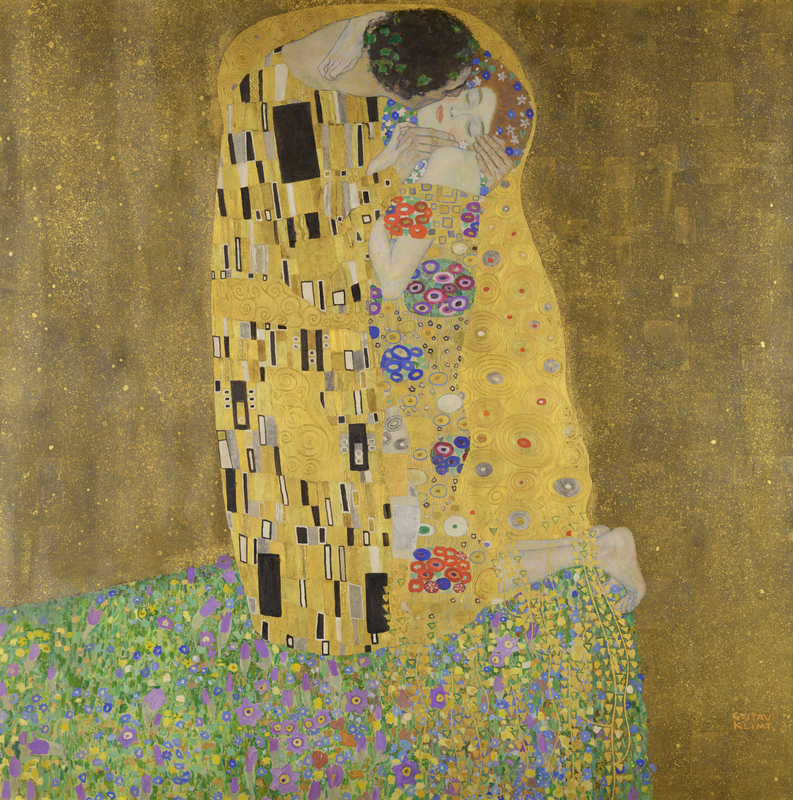 Statement: Klimt’s painting ‘The Kiss’ is one of his most iconic works, painted between 1907 and 1908, it epitomises both his ‘gold period’ and symbolist painting style. Standing at 1.8m x 1.8m, the huge square canvas is painted with thick oil paints and accented with delicate gold leaf detailing on the figures’ cloaks. The work itself is an amazing example of art expressing emotion, with the use of pattern and harmonious colour working together to create a sense of comfort and affection. Technique + Example: Klimt used warm yellows and golds throughout the painting to create a sense of calm and happiness, these colours both holding connotations of positive emotions and comfort as well as being harmonious colours found together on the colour wheel. Pattern has also been used in the image, with the close, delicate patterns in the flowers and cloaks creating a feeling of closeness. Effect: Together the use of harmonious, warm colours and close patterns creates an impression of comfort and affection, furthering the sense of love and tenderness seen in the figures. This works to create an image that embodies the emotions of affection, comfort and happiness, proving that the painting is an exemplary representation of how art can express emotion. Put these three elements together and you’ll have a kickass response in no time! Even though HSC Visual Arts unseen image questions can be really daunting and push you into panic-mode, try to remember that they’re unseen images for a reason. No marker is going to expect you to know the background of an image you’ve never seen before, so make the most of what information you do have and write away! 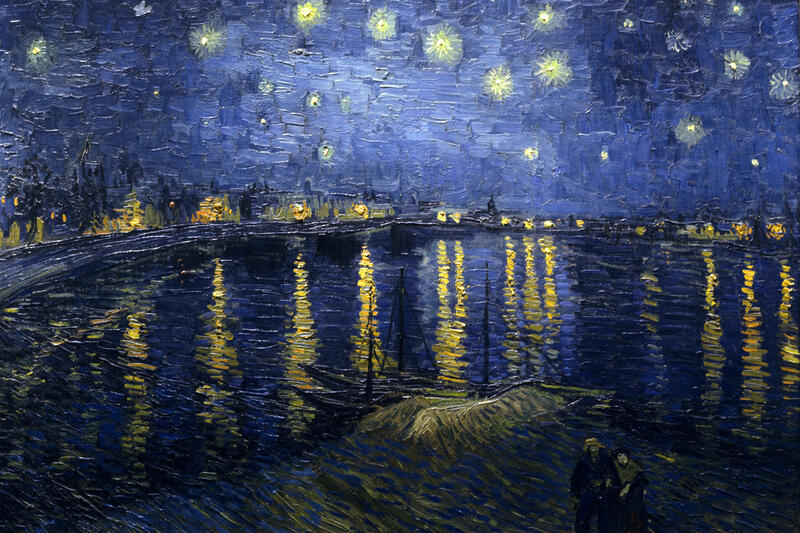 Using this image of ‘Starry Night Over the Rhone’ by Vincent Van Gogh try going through each of the steps above and creating your own perfect paragraph for it! Maddison Leach completed her HSC in 2014, achieving an ATAR of 98.00 and Band 6 in all her subjects. Having tutored privately for two years before joining Art of Smart, she enjoys helping students through the academic and other aspects of school life, even though it sometimes makes her feel old. Maddison has had a passion for writing since her early teens, having had several short stories published before joining the world of blogging. She’s currently studying a Bachelor of Design at the University of Technology Sydney and spends most of her time trying not to get caught sketching people on trains.